37,000 nurses and midwives take part in second 24-hour strike | SHEmazing! A second 24-hour strike by 37,000 nurses and midwives will take place today, February 5. They have taken to the picket line to fight for pay parity with other healthcare professionals. The number of services on strike has increased from 82 to 240, meaning up to 50,000 people will be affected by today’s strike. Tonight you will go home. Nurse's carry home witnessing the dying breath of a man, the touch of a child with burns, the broken mind of a women just diagnosed with cancer …. and will come back tomorrow. The public has been warned to stay away from emergency departments while the strike is ongoing. It is understood that all outpatient appointments, routine community nursing activities and surgeries have been cancelled. Centres for old people that are run by nurses have also been closed. As have local injury units. Health Minister Simon Harris and Finance Minister Paschal Donohoe called for urgent talks that would focus on a ‘safe staffing framework’ rather than pay. 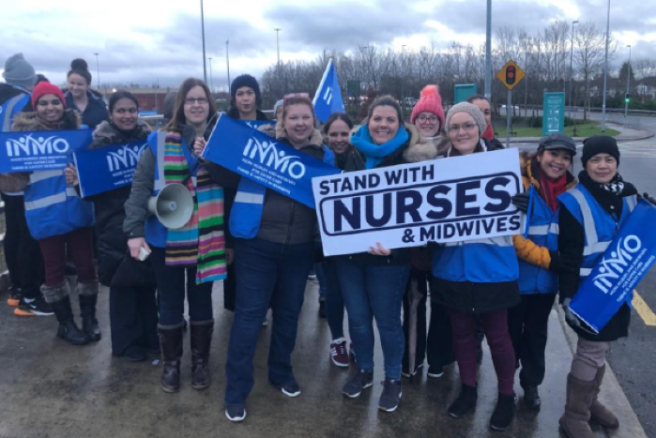 The offer to discuss this was declined by Phil Ní Sheaghdha, who is the general secretary of the Irish Nurses and Midwives Organisation. The nurses are striking for the pay increase they deserve. They have called for a 12 percent pay increase, however, the Government is reluctant to agree to this request as they believe it will cause other public service unions to call for the same. Good luck to all of those striking today.